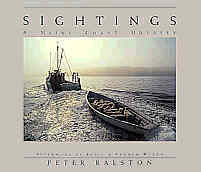 Sightings A Maine Coast Odyssey by Peter Ralston (Down East Books; 145pp; $50.) is first, a stunning collection of color photographs by the art director of the Island Institute's Island Journal. Secondly it is the story of a successful transition of a thoughtful person out of one life and into another. That story, told in 5 short essays and 129 evocative color photographs is Peter Ralston's odyssey. Ralston grew up practically next door to the Wyeth family in Pennsylvania. As an adult he pursued a career as a photojournalist, even studying briefly with Ansel Adams. He had never been to Maine until 1978 when he was invited to visit the Wyeths in Cushing. The visit dispelled his rather tepid impression of Maine as the scene of idyllic summer seaside picnics and little else. He stayed 6 months. When he resumed his career, Ralston was already planning his return. In 1987 he finally moved to Maine permanently to work full time for the Island Institute which he had helped found. If only more transplants were like Peter Ralston, willing to make the ceaseless investment of "time, strength, cash, and patience" in his adopted home. In his afterword, Ralston states that, "Like the best fishermen, I've had to know the terrritory and respect the rules, be ready to take a few calculated risks when it felt right, look people in the eye, keep the gear as simple as possible, get out early, come in late, watch the sky, and above all, respect the people and place where I work." Ralston's photographs of Maine islands and island people express the strength of this rare commitment. His unique approach to his art is only partially aesthetic. As Chris Crosman, director of the Farnsworth Art Museum, observes in the introduction to Sightings, "He does not display this [island] life as always pretty or 'nice' or picturesque." The theme that binds the book, says Crosman, is the notion that "islands may be the last places where self-reliance is coupled with a keen sense of community. That sense of community is certainly evident in all 129 color photgraphs but the heightened dangers of winter may be the reason the stark winter images, in particular, are so emotionally packed. Ralston says, "Winter is the measure of one's resolve and abilities to make it here. Winter is the ultimate 'going deep' (a Wyeth phrase)…The buzzing, frantic activity of summer is gone and it's down to basics—physical and mental. I, as it turns out, love it...People who haven't been here for the winter wonder what on earth gets us through. It's each other…and the knowledge that once again we will ride it out and spring will come to our emotional rescue, redeem us, and we quietly honor ourselves and all the other survivors." Sightings celebrates survivors in a moving and tangible way.